Goettingen, Germany, January 21, 2019 / B3C newswire / -- Sartorius Stedim Biotech (SSB), a leading international supplier for the biopharmaceutical industry today announced the launch of the BIOSTAT® RM TX single-use bioreactor, a new wave mixed system developed specifically for closed, automated expansion of consistent quality cell products such as ex vivo cellular immunotherapies. This new GMP platform, which combines SSB’s established single-use Flexsafe® bag technology with the company’s expertise in biopharmaceutical automation, will be introduced at Phacilitate Leaders World 2019 in Miami, USA (January 22-25 / Booth 410). 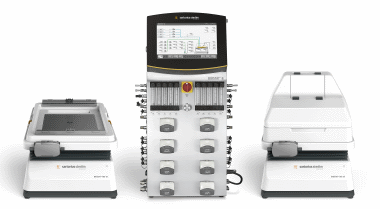 Photo 1 (shown above): BIOSTAT ® RM TX automated twin system for culturing of consistent quality cells. Photo 2: Flexsafe® RM 2L TX bag with single-use BioPAT® ViaMass, Sartopore® Air vent filters and patented perfusion filter. Photo 3: Flexsafe® RM TX Harvest Device for hands-free gravity harvest of the cell culture with maximum recovery.